Slow intentions and speedy sews! What a terrific theme for November’s monthly stitch, coming on the heels of the rapid-fire Indie Pattern Month in October! I have two garments to post about this month, both of which turned out to be super-speedy makes, but they came about as a result of fairly slow and intentional thinking and planning about what I needed to sew. 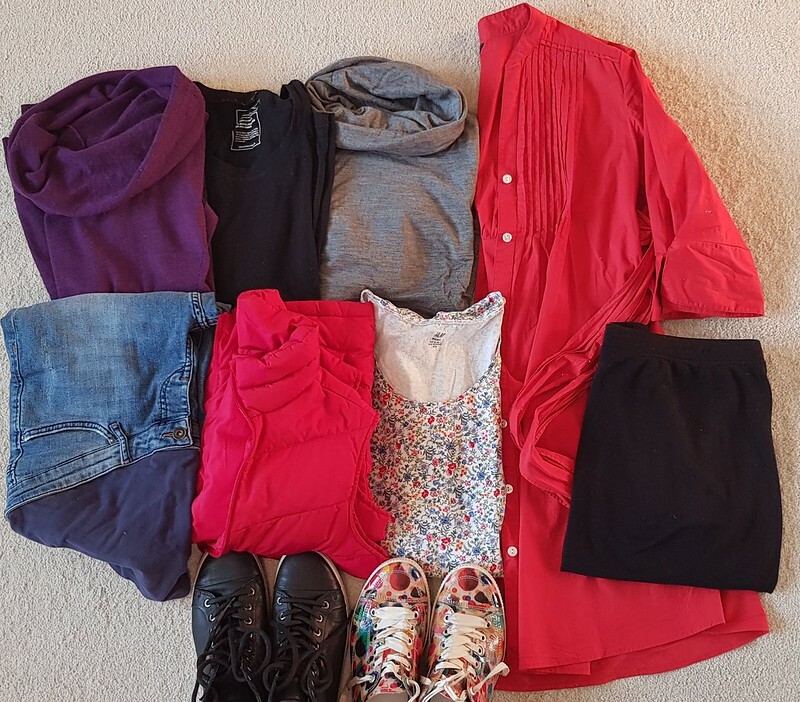 In late October, I participated in the Fall 10×10 challenge organised by StyleBee – it is not specifically a sewing challenge, but more of a styling / fashion challenge to see how you can mix and match just ten items of clothing every day for 10 days. Interestingly none of my ten garments were me-mades! The object of a challenge like this is not to then rush out and buy (or sew) more clothes, but to make use of and celebrate what you have. I was surprised by how much I enjoyed being limited to just a small number of clothes for the 10 days and this got me thinking about my sewing plans and my wardrobe in general. I really don’t need that many clothes! But what I did find that I needed were a variety of leggings and tights (with winter on the way I wanted to be able to wear more than just jeans all the time) so I set about searching for a straightforward pattern for leggings. Plus (you may have worked out from the photos!) I was in the late stages of pregnancy, and so needed some tops that would be suitable for breast-feeding when baby came. Enter my sewing diary and My Body Model! Clearly, the croquis was not designed to accommodate a pregnant form but I think overall they got my proportions about right. It is a great resource for us sewists and I spent lots of time this month drawing different styles of nursing tops to see what suited me best. I look forward to re-measuring my own croquis in a few months time when my shape returns to relative (!) normality. As you can see from my drawings, I’m no artist, but the colouring in was great fun! I decided to try the Virginia leggings by Megan Nielsen, and boy do they fit the bill! The pattern comes with both normal and low-rise options (the low-rise being perfect for under-the-bump maternity leggings). I cut out and sewed this pair in black cotton/spandex in my 2-hour sewing class. It was that easy! 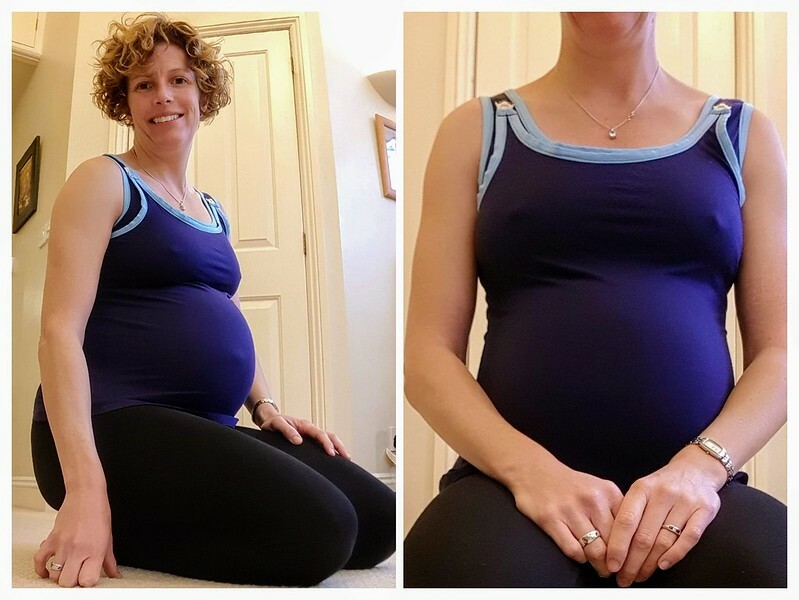 I didn’t add elastic to the waist (not required at 39 weeks!) but will now go back and put some in now that the baby is here and the bump has reduced in size. I used my overlocker for all of the seams and my twin needle for the hems. The size was spot-on (I cut the small) although, as noted by the pattern, I did cut about 3 inches off the bottom as they were very long. 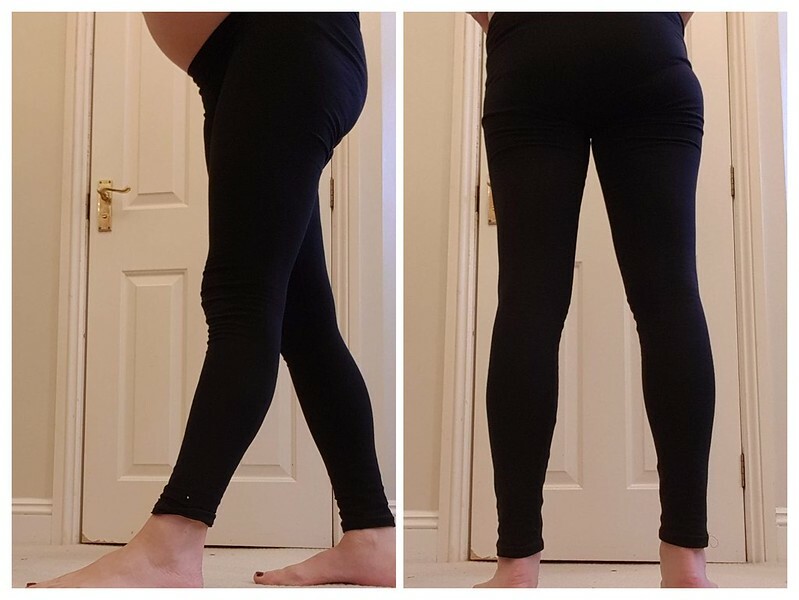 This is such an easy, straightforward, basic leggings pattern it makes me wonder why I haven’t made them before – it is almost easier to whip up a pair of these than it is to travel in to town to buy some (or wait for Amazon to deliver them!). I think there are four seams in total? And when it can all be done on the overlocker, it really is a cinch. The next make this month was the Versatility Nursing tank top with shelf bra by 5 out of 4 patterns. This was a new-to-me pattern company that I discovered during Indie Pattern Month – they have a terrific range of styles, for all ages and stages. Again, I took the time to think carefully and plan my sewing, as you can see in my sewing journal. This top is a bit of a wearable muslin for me as well – I wanted to be sure it would work before I made it again in colours that were more my everyday style. I used an old navy lightweight cotton jersey that has been in my stash for at least 8 years (!) – my sewing machine struggled with it a bit but in the end we decided it was the poor-quality sewing thread that I had used that was the problem – quite a few dropped stitches. Note to self: there’s a reason not to use free sewing thread! This was solved by using a lightning stitch for almost all the seams. The fold-over elastic took a bit of getting used to and I think next time I’ll try to stretch it a bit more than I did as the seams gape just a bit at the nape of the neck and the armpits (it is less of a problem now that I’m actually nursing!). It was a really nice quality FOE – soft on both sides, not shiny – I find the quality of that stuff varies significantly without any reference to price or where I buy it! I cut a size small (A/B cups) according to my measurements but next time I’ll go up to a C or D cup – the only difference is that the shelf bra is a bit longer on the larger cup size so I think that will be more comfortable for me. There is a maternity option but I just went with the regular size (the jersey was quite stretchy). 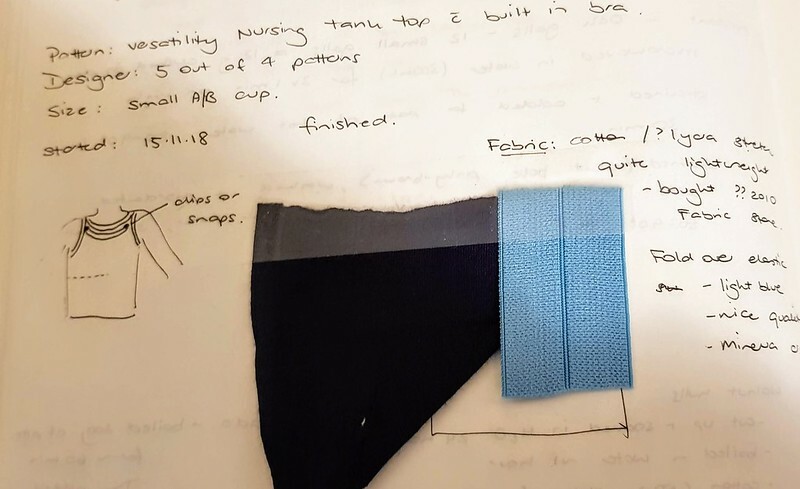 The pattern instructions are very clear and I really like how the shelf bra is constructed – not a huge amount of support but certainly good coverage for nursing. I can see how this technique could be transferred to other top patterns to convert them into nursing-wear. Again, this was a quick make – probably 5-6 hours in total (I’m not very fast at the best of times!) – but it came after much consideration and planning, so perhaps that was why it came together so speedily? I’m really pleased with these two items – they are basics that will be worn frequently and that can form part of a smaller ‘capsule’ wardrobe. It sure makes getting dressed in the morning less of a struggle and I hope I can participate in the Spring 10×10 challenge with items that I have made myself!